Raspberry Swirl Cheesecake Bars are a decadent dessert made on the lighter side that is simple to make. If you’re intimidated by making a full cheesecake, or just looking for a quick and easy recipe for a cheesecake fix, then these bars are you for you! In 30 minutes you make the crust, the cheesecake filling, and even a fresh raspberry sauce…. Black Bottom Cupcakes are one of my favorite desserts to make (and eat!). They are chocolate cake and chocolate chip cheesecake at its finest, and they are so quick and easy to make. The chocolate cake is a nice and light basic chocolate cake, which pairs nicely with the rich chocolate chip cheesecake filling. The cheesecake filling takes the place of buttery frosting, which makes these cupcakes a lighter option. They’re also less messy, making these one of my go-tos when I’m in charge of bringing a dessert. Everybody always loves them. 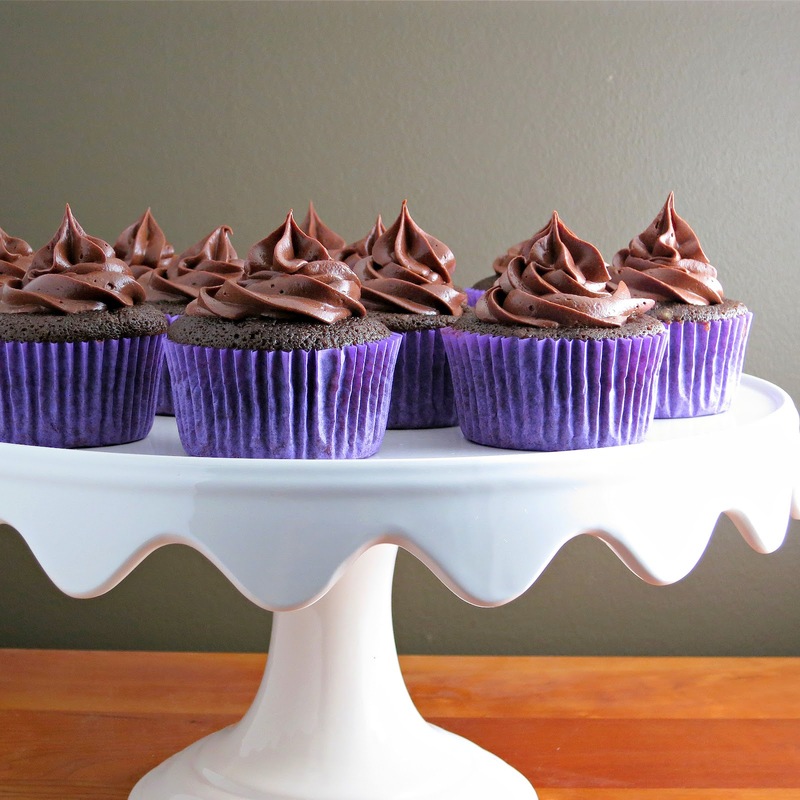 Black Bottom Cupcakes are made with simple ingredients that can be kept on hand at all times, making them perfect for parties, travel, potlucks, or simply when the craving strikes. Preheat oven to 350 degrees. Line muffin tin cups with paper liners or spray with cooking spray. Set aside. First make the filling: In a small bowl, beat cream cheese, egg, sugar and egg until combined and fluffy. Stir in chocolate chips and set aside. Then make then cake: In a large bowl, whisk together flour, sugar, cocoa, baking powder and salt (if using). Make a well in the center. In a small bowl, stir water, oil, vinegar and vanilla until combined. (Note: I just mix everything in my liquid measuring cup...one less dish to wash). Add liquid mixture to dry ingredients, pouring into the well. Fold gently until well blended. Divide cake batter evenly among prepared muffin cups. Then divide the filling evenly over cake batter by spooning a dollop of the cream cheese filling over the cake batter. Bake for 20 to 25 minutes, or until cake is set. Let cool in pan for 5 minutes and then transfer to a wire rack to cool completely. Last Saturday was a special anniversary. 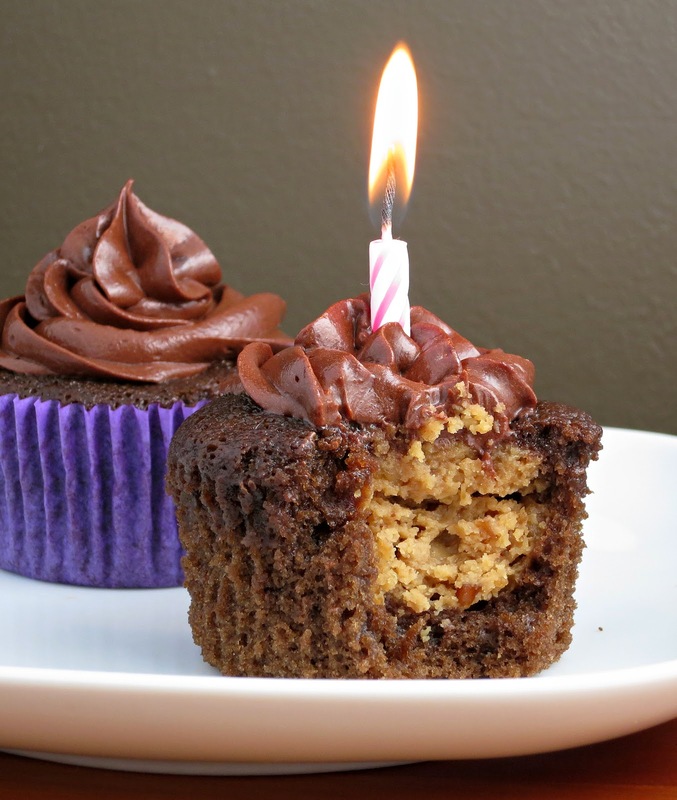 An anniversary worthy of these Chocolate Peanut Butter Cupcakes made with chocolate cake, filled with peanut butter and topped with a fluffy chocolate frosting. These cupcakes are light, decadent and perfect to celebrate this milestone anniversary. This anniversary in question, or blog-o-versary as some call it, marks the 1 year anniversary of Alida’s Kitchen! The chocolate/peanut butter combination is always a winner for any celebration. I doubled the amount of peanut butter filling from the original recipe, which resulted in a generous amount of peanut butter. It had a good peanut butter to chocolate ratio, which is key. I used my go-to chocolate frosting, which is a classic and pipes really nicely. 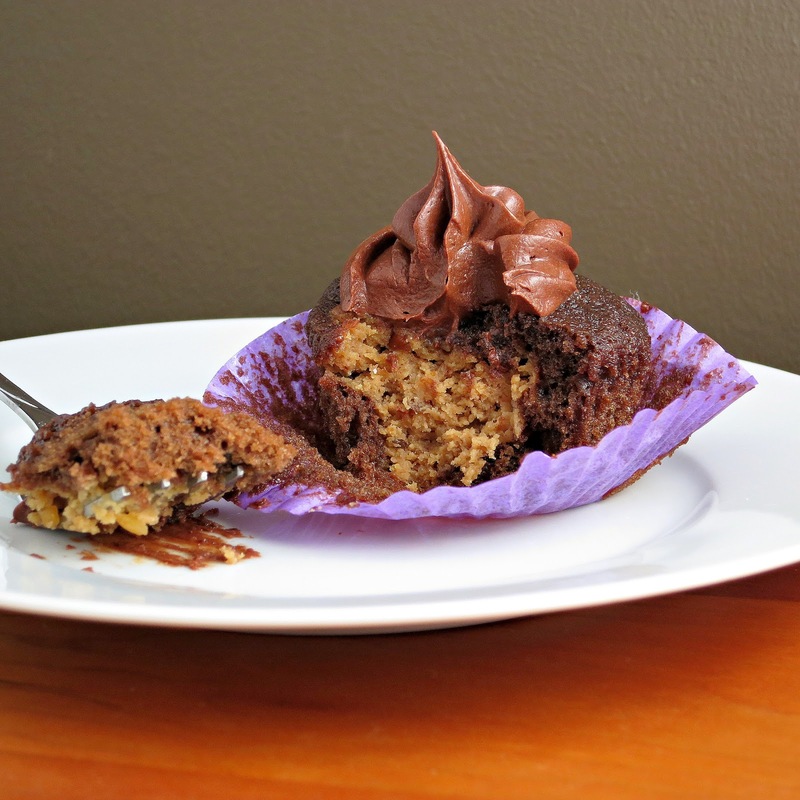 These Chocolate Peanut Butter Cupcakes were super easy to make and the result was the perfect treat to celebrate the 1 year blog-o-versary of Alida’s Kitchen. I want to thank you all so much for visiting and for cooking and baking with me this past year! Make Filling: In a small bowl, beat cream cheese, peanut butter, sugar, and milk until combined. Set aside. Make Cake: Preheat oven to 350 degrees. Line 24 muffin cups with paper liners and set aside. In a large bowl, whisk sugar, flour, cocoa, baking powder, salt and baking soda. In a separate bowl, whisk the eggs, water, milk, oil and vanilla. Fold into dry ingredients until just moistened. (note: batter will be thin). Fill prepared muffin cups half full with batter. Divide filling evenly amongst the 24 cups, dropping spoonfuls of filling in the center of each cup (Tip: using a scale is handy for measuring and even distribution. If you don’t have a scale, The filling amounts to approx. a generous rounded tablespoon per cupcake). Cover each cup with remaining batter. Bake for 20 to 25 minutes, or until a toothpick inserted into cake comes out clean. Cool for 10 minutes in the pan and the move cupcakes to a wire rack to cool completely. Once cooled, frost with chocolate frosting and decorate as desired. Make Frosting: Melt the butter. Whisk in the cocoa powder, whisking until smooth. Stir in vanilla and alternately add powdered sugar and milk, using a hand mixer (or stand mixer) to beat to spreading consistency. Add small amount additional milk, if needed. Today is March 14th, which means it’s National Pi(e) Day! So in honor of this day, I am sharing with you Butterfinger Cheesecake Pie. I am not lying when I tell you this is one of the best desserts I have ever had. Plus, it is super easy to make, making it an ideal make-ahead dessert for a party, potluck, or simply to celebrate Pi! The hands-on time takes less than 15 minutes, and the bulk of that time is in chopping the candy. The pie is baked to set the cheesecake filling and then chilled for several hours (overnight works great). I used a premade graham cracker pie crust. A from-scratch crust is pretty easy to make though. It all works. The result is a delicious slice of cheesecake filled with chunks of Butterfinger – so good. I love this recipe because you can easily swap out the Butterfinger for the same amounts of whatever candy or cookie mix-ins strikes you. You can also mix up the crust, using a chocolate cookie crust, graham cracker, or whatever you like. The possibilities are endless, though I am quite happy to celebrate this day with a piece of Butterfinger Cheesecake Pie. Happy Pi Day! Using an electric mixer (or hand mixer) set to medium-high, beat cream cheese, sugar, eggs, and vanilla until well-blended. Fold in 2 cups candy, mixing until combined. Pour cream cheese mixture into pie crust (it will be very full!). Bake for 40-45 minutes, or until filling has set. Remove from oven and let cool for about 30 minutes. Sprinkle remaining candy over the top (or save some to use as garnish) and chill in the refrigerator for 8 to 10 hours (or overnight). Garnish with crushed candy, chocolate syrup and/or whipped cream, as desired, before serving. It seems we save cupcakes for a special occasion – to celebrate a birthday, a holiday, an accomplishment, etc. When I made these cupcakes, I didn’t have any particular occasion in mind. I decided to make these Pink Grapefruit Cupcakes ‘just because.’ Just because it’s been a while since I last made cupcakes. Just because there is always a reason to celebrate something. Just because citrus is aplenty right now,…let’s try something new! These cupcakes are really easy to make and a unique way to enjoy grapefruit. The cake alone has a subtle citrus flavor – just enough grapefruit flavor without being overpowering. When topped with the grapefruit cream cheese frosting, it becomes dangerouly good. The cream cheese gives the right amount of tang to balance the grapefruit flavor and brings it all together into a sweet and delicious cupcake. Preheat oven to 350 degrees. Line 12-cup muffin pan with paper liners. Set aside. 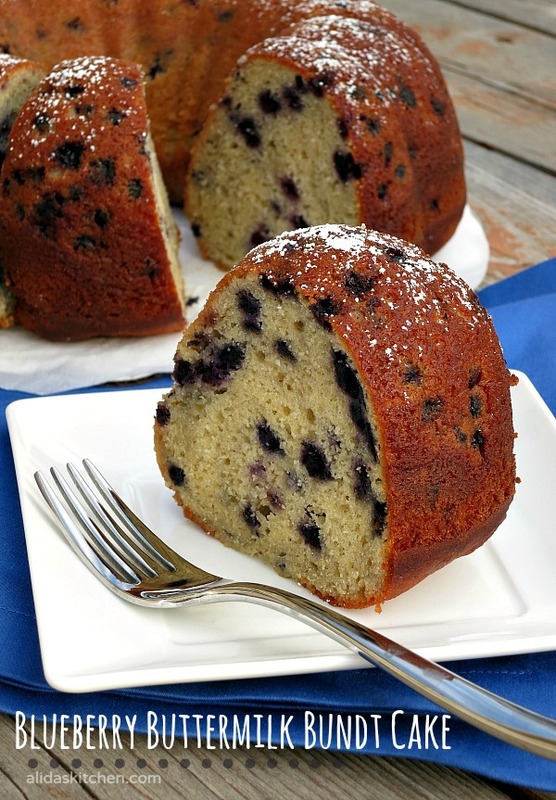 In a large bowl, beat butter and sugar with an electric mixer until light and fluffy. Add eggs; mix until smooth. To the butter mixture, add half of flour mixture, and combine; repeat with remaining flour mixture. Add yogurt and vanilla, blending with a rubber spatula. Fold in zest, mixing until just combined. Divide batter evenly among prepared muffin cups (about ⅔ full). Bake for 13-15 minutes, or until a toothpick inserted in the center comes out clean. Remove from oven and let cool for 5 minutes. Transfer cupcakes to wire rack to cool completely before frosting. To make the frosting, place cream cheese in a medium bowl and baet on medium speed until smooth and creamy. Add powdered sugar, vanilla zest and juice, beating until smooth. Frost cupcakes as desired. If not serving immediately, cupcakes/frosting should be refrigerated, otherwise, the frosting gets too soft. When serving, let cupcake sit out for 10-15 minutes at room temperature.